Should You Change Formula if Your Baby is Gassy? Gas is most often caused by an infant swallowing too much air while feeding. However, the type of formula you are using may be causing your little one unwanted stomach distress. Before you switch infant formula, first use natural remedies to relieve gas, including massage, burping, holding your baby upright and supervised tummy time. If all else fails, try a formula switch. Once symptoms dissipate, keep your baby on the same type of formula to avoid future gas and digestive problems. If your pediatrician suspects your baby is allergic to the type of formula you are using, ask him to suggest a switch. Signs that your baby is allergic to the formula include excessive gas, loose stools, rashes, fatigue and forceful vomiting. If a formula switch does not resolve digestive issues, seek tests to see if a medical condition is causing bowel changes. Keep a feeding journal that keeps track of feeding times and bowel movements. An intolerance to lactose, found in dairy milk-based formulas, can cause gas and abdominal distress in infants. 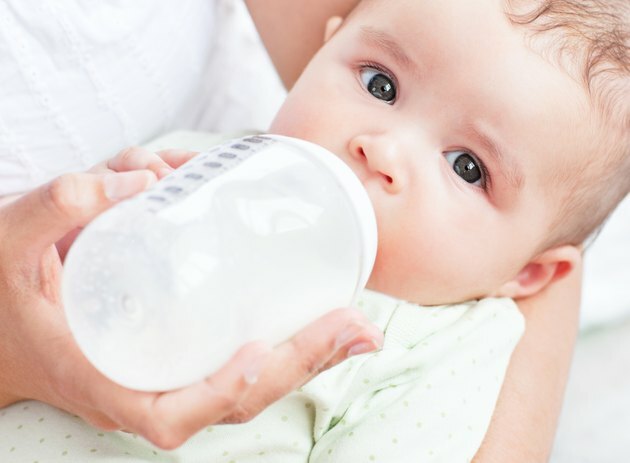 Lactose-free infant formulas can be used in place of cow's milk formulas in diagnosed infants who are experiencing excessive gas as a result of the disease. Corn syrup is often used instead of the lactose in the formula. A milk allergy in infants occurs in approximately two to three percent of babies, according to the KidsHealth website from the Nemours Foundation. It differs from lactose intolerance, but also produces gas symptoms and requires a formula switch from cow's milk. Soy and hypoallergenic formulas are typically used for milk allergy treatments. Soy formula is another type of formula, derived from plant protein and an acceptable option for vegan parents. The American Academy of Pediatrics advises caution when choosing a formula for a baby with a true milk allergy. Soy protein is another common food allergen. Up to half of infants with a true milk allergy also have an allergy to soy protein, according to the AAP. When your baby has colic with symptoms of gas and fussiness, ask your doctor about trying a formula switch. Extensively hydrolyzed formulas are available to help the baby digest the food easier. The proteins in the formula are broken down into smaller proteins. Besides colic, extensively hydrolyzed formulas are recommended to infants with problems absorbing nutrients and food allergies.